I've been reading David Byrne's journal (of the Talking Heads fame) since before I heard about blogs and blogging. In an ocean of software blogs that flood my Google Reader, it's one of the few that remind me that I have other interests besides computers. From this journal I found out that he also hosts an internet radio station that I've been often enjoying while at work or sometimes at home. For this task I've been using iTunes on my Mac at home and Rhythmbox on Linux at work. Besides the easier subscription to the station, the one thing I miss from iTunes while at work is seeing the currently playing song on Rhythmbox. I don't know how iTunes does it, but it's always showing the correct song title and artist, while on Rhythmbox all I see is the station name. 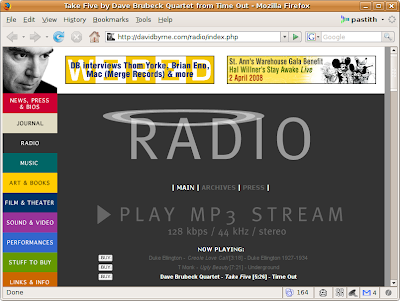 Therefore I had resorted to having a tab open in Firefox all day that displayed the radio home page that shows the playlist and refreshes each time a new song begins. I still had to switch to the browser from whatever I was doing when a new song started, in order to glance on its title and performer. A few days ago I thought to myself: "wouldn't it be nice to have the Firefox title bar display that information and only take my eyes off what I'm currently doing and not my fingers too? ".